We partly think ‘who for?’ being as New Zealand don’t exactly have heaps of Test class players obscuring every inch of their idyllic scenery. The answer is Mark Gillespie, who seems okay, but ‘okay’ won’t help Chris Martin accept the decision. Martin always has the look of a good bowler, but somehow never takes too many wickets. If we were a Test batsman, we’d love facing Chris Martin. You’d score a hundred and you could say that you did so against good bowling. There are some mediocre bowlers who have the knack of taking wickets. Chris Martin has the knack of not taking wickets. 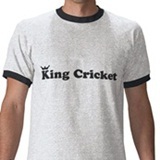 Didn’t he once comment on King Cricket? Don’t get starstruck readers – that was actually his inferior, singing namesake who commented. some say, martin last picked up a wicket during the last ice age. we dint believe that for a second because you simply cannot play cricket on ice. Sounds like ‘Trouble’ for Martin. He doesn’t really bowl at the ‘Speed of Sound’ though. I guess ‘The Hardest Part’ of cricket is getting dropped. I’d say to him ‘Don’t Panic’ but he must be thinking Gillespie is ‘In My Place’. He has the knack of not scoring runs, too. He’s got it to the point of being an art form, in fact. “It’s well grassed, and hard and I’d suggest has a little more pace than the Bangladesh test [a year ago] and maybe a little more bounce. Chris Martin had a big hit a few years back, but since then he’s basically recycled the same old stuff. It’s nice enough, but pretty MOR. We need something a bit more rock and roll at the top of our playlist.